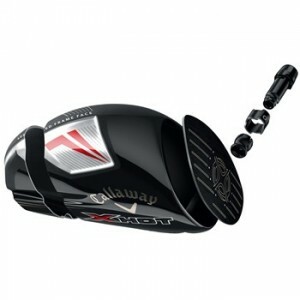 Callaway Golf Co. (NYSE: ELY) has announced their new family of X Hot drivers and fairways and says the driver produces “blistering ball speeds and distance gains” of 13-yards compared to their RAZR X Black driver. Using their Speed Frame™ Face Technology saves weight and gives more efficient energy transfer and Callaway says their new technology promotes more and more consistent distance even on off-center hits. The X Hot drivers uses the thinnest casting technology they have ever made in a titanium head to help golfers with average swing speeds. The OptiFit Hosel for face angle (open, square, closed) allows adjustment to suit the users needs. The Standard Callaway X Hot Driver (460 cc – 9.5-, 10.5-, 11.5-degree and 13-degree HT) is lighter and has a lower swing weight than the X Hot Pro (440 cc – 8.5-, 9.5- and 10.5-degree) which also has more open face angles. Available February 15, both have a street price of $299. X Hot fairways have a forged Speed Frame Face Cup of stainless steel that is 40 percent thinner than last year’s comparable model and has a 90 percent larger sweet spot. The Standard X Hot fairways will have slightly longer shafts and more upright lies compared to the X Hot Pro model both carry a street price of $229.